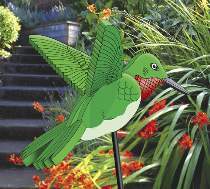 Brighten up your flower garden with this beautifully designed jumbo size hummingbird. Patterns drawn FULL SIZE. Measures 23”H x 19”W. Order one pair of yellow eyes and two fiberglass rods for each project separately below.